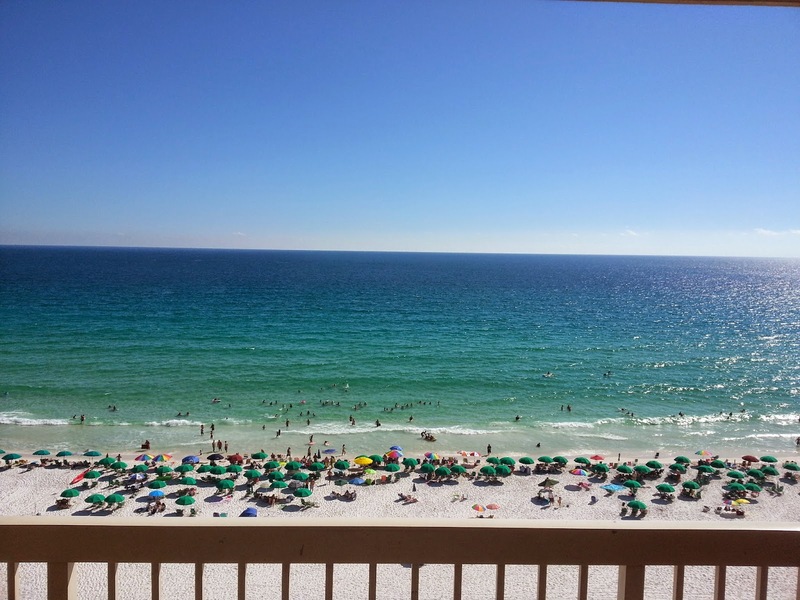 Are you looking for a one bedroom or two bedroom beachfront condo rental in Destin? If so there is no better place than the Pelican Beach Resort in Destin. The resort is a high rise(19 stories) built in 1997 with all the one bedroom units directly facing the water and almost all the 2 bedrooms on an angle to the water. The corner stack(2 bedroom) has both views. The Pelican building(where my units are located) is directly on the beach. Not only is there lots of beach just for the Pelican guests but an indoor/outdoor pool and another outdoor pool as well. We also have an exercise room, sauna and steam bath. During the spring break, summer and fall break there is special activities for the kids. If you are reading this you can see my calendar over on the left side. Pick some dates and give me a call at 731-589-7841 and lets quote and book your next Destin beach vacation. Looking For Beachfront Condo Rentals In Destin? 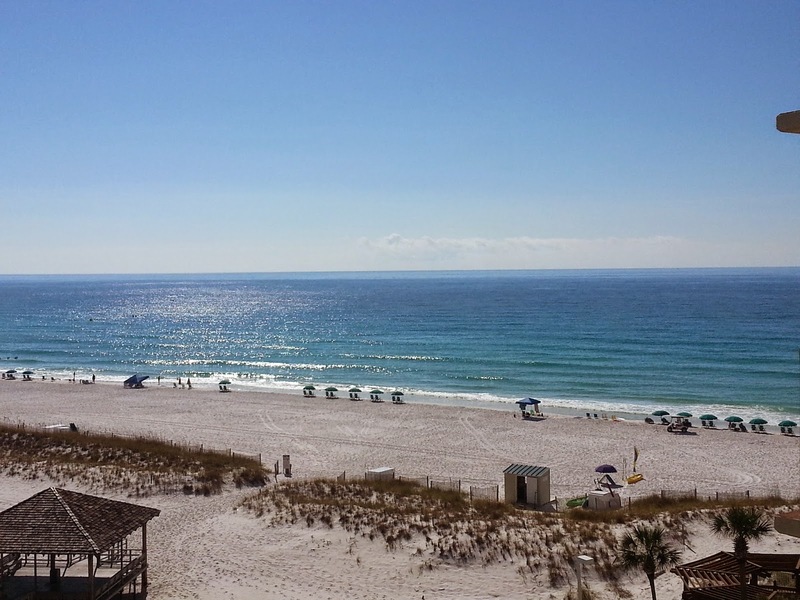 Are you looking for beachfront condo rentals in Destin? If so you have found it. Actually you have found 2 beachfront condo rentals in Destin. 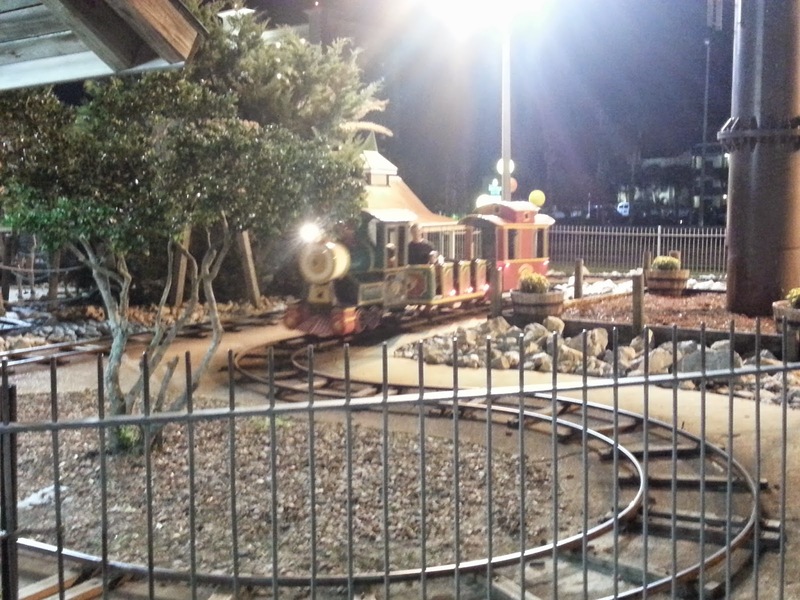 Both of these are at the Destin Pelican Beach Resort. Instead of going through one of the middle guys, just grab their price and call or text me at 731-589-7841 and let me have the opportunity to beat their price. I have always been able to if we are comparing apples to apples. I have 2 premium beachfront condos both fully remodeled but one is a one bedroom, 2 full baths, hallway bunks and sleeper couch(sleeps 6) and the other is a two bedroom, 2 full baths and sleeper couch and it also sleeps 6. These are some of the most sought after units at the Pelican Beach Resort Destin. As you can see I am proud of these units but I love for others to also enjoy them like my family does. The booking calendars are over on the left side and were just updated today so hurry and grab your dates and call me. Looking To Book A Pelican Beach Resort Destin One Bedroom Deal In December? Are you looking to book a Pelican Beach Resort Destin one bedroom deal in December? If so, here is a fantastic discount for 7 days and nights in the Pelican Beach Resort's nicest one bedroom(sleeps 6). 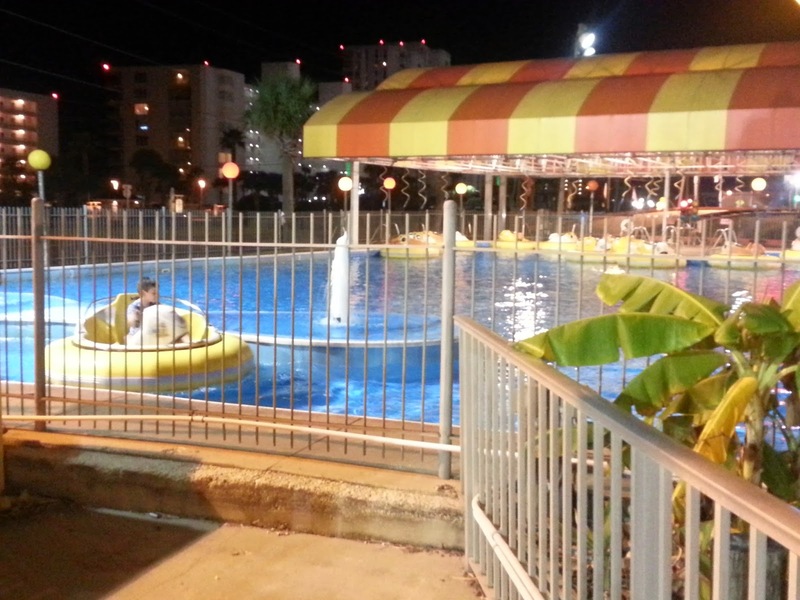 If you go online with the management company right now at Pelican Beach and enter any 7 days and nights in December they are offering a deal at $678 plus tax and fees that comes up to $863.58. I can offer you any of the same 7 days or nights except Dec 26-30th for only $632.80 plus part of the tax and fees with my total at $799. Shop that rate for a premium deluxe plus one bedroom at the Pelican and you will see what a fantastic deal this is. Contact me at 731-589-7841 to grab this December deal at the Pelican Beach Resort in Destin. I just found out that there are several other Pelican Beach Resort Destin owners upgrading their units as well. A few months ago I joined a closed facebook group just for owners and right now we have at least 30-35 owners who have joined the group. What many of them are saying is that they are also remodeling their units and making extensive upgrades. I plan to check out some of these extensive upgrades just so I can refer you to their units if mine is booked for the dates you want. If you are planning your next vacation to the Pelican Beach Resort Destin, check my calendar over on the left side and call me if my unit is available or not available as we have several other options. My direct number is 731-589-7841. My family would like to share with you 7 more reasons we love vacationing at the Pelican Beach Resort in Destin. Actually I am going to give you 7 names of the staff that assist us everytime we check in at the resort. First of all there is Keith who is the front desk/reservations supervisor. Keith will do almost anything at all that we need when we are at the resort. He was prior military(Air Force like me) and very disciplined and not afraid of work. He always has a smile on his face and you can tell he loves his job. The second reason we love vacationing at the Destin Pelican Beach Resort is DeeDee. She has been there since 1998 and she is in the know. I believe she is a supervisor as well but if the guys or girls on the front desk do not know something DeeDee is the expert. The third reason we love travelling down to the Pelican Beach Resort is Nikki. She is one of the day shift front desk girls. She knows us by name and you can tell she loves her job. Rachael, is reason number 4 we love the Resort at Pelican Beach. She is also a front desk girl who like Nikki greats us with a smile and always very helpful. When I call the resort to make a booking I don't even have to tell them who I am. We are almost like family. The 5th reason we love the resort is Terry and then 6th is Chad. They are both night front desk staff. Sometimes we leave Dyersburg late in the day and arrive around 2-3am. Terry or Henry is there to greet us and we consider both part of our family. Last but not least is Thomas. He came on board about the time we purchased our first Destin beachfront condo at the Pelican(5 years ago). Thomas was the front desk supervisor but now he is heading up the homeowners association. We also love Thomas and he too is a go to guy. I could go on and on about others at the resort but these 7 will make you feel at home during your stay at the Pelican Beach Resort in Destin. 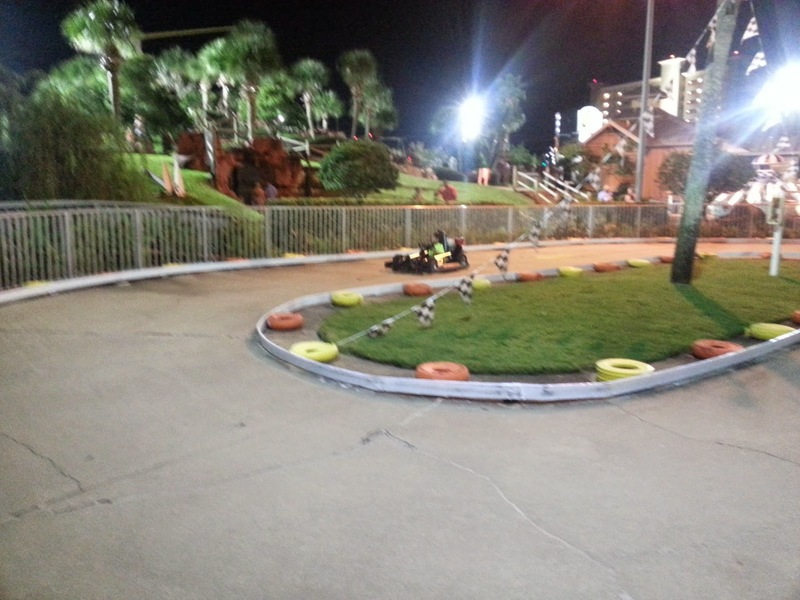 I just wanted to share a couple of pictures I took at the Pelican Beach Resort in Destin during my last trip. I took these pictures off the balcony of Pelican Beach Resort unit #714. 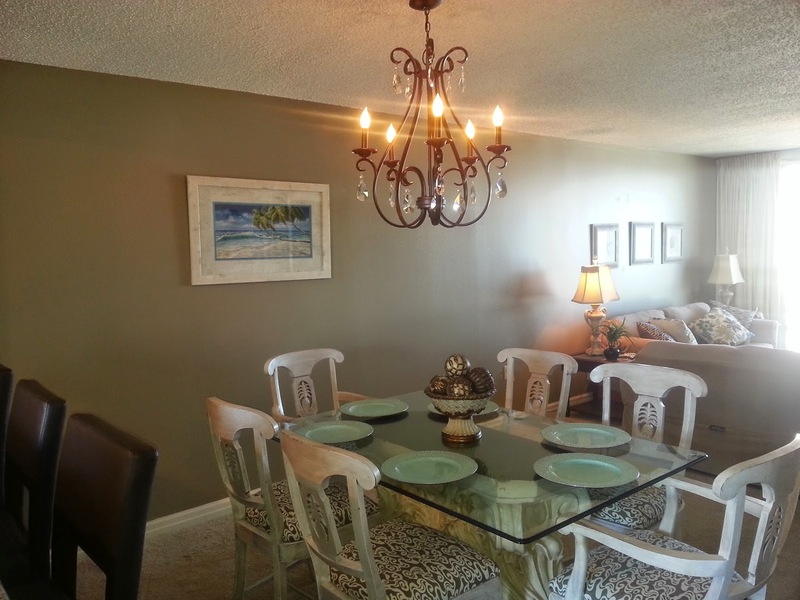 My Pelican Beach Resort Destin # 714 condo has been remodelled. Actually we got everything done in 5 short days except tiling the living room/dining room areas. Hopefully I will go back down in a couple of weeks and get that completed. We also ordered a new sleeper sofa, love seat and accent chair today. 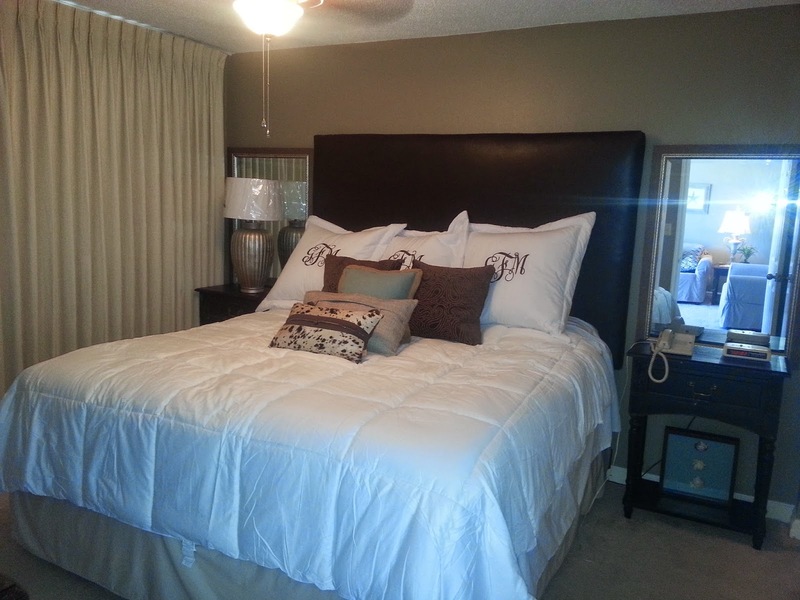 We repainted every room and installed custom head boards(made by my wife) in both bedrooms. She also recovered the dining room chairs. Gail and I discarded the original queen bed and mattresses and installed twin beds(all new) and Gail made new custom drapery for this room as well. We also installed lots of new wall pictures, picture mirrors and accessory items. I am posting pictures down below. The Frazier Family just closed on the purchase of Destin Pelican Beach Resort unit #714. We are so excited for you to see the changes we have planned for this unit. If you liked what we did in #1004, you are going to love the new #714. My wife and I are headed down this weekend to begin the extreme updating we have planned. I will take pictures of our improvements and post them back here. I added the a new availability calendar just for that unit under the other calendar for #1004. If you are looking for a very very nice Destin beachfront condo to rent for your family vacation, we now have two for you to chose from. Call or text me at 731-589-7841 to book your stay at the Pelican Beach Resort in Destin. Are you looking for a beachfront condo to rent in Destin? 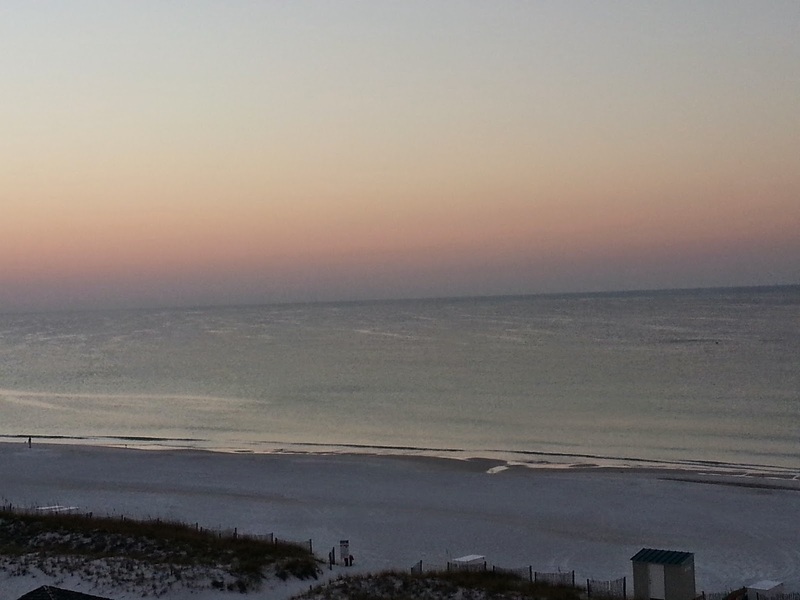 If so, check out these views from my two Pelican Beach Resort Destin condos. Are you headed to the Pelican Beach Resort Destin during October? If so check out the fishing rodeo. 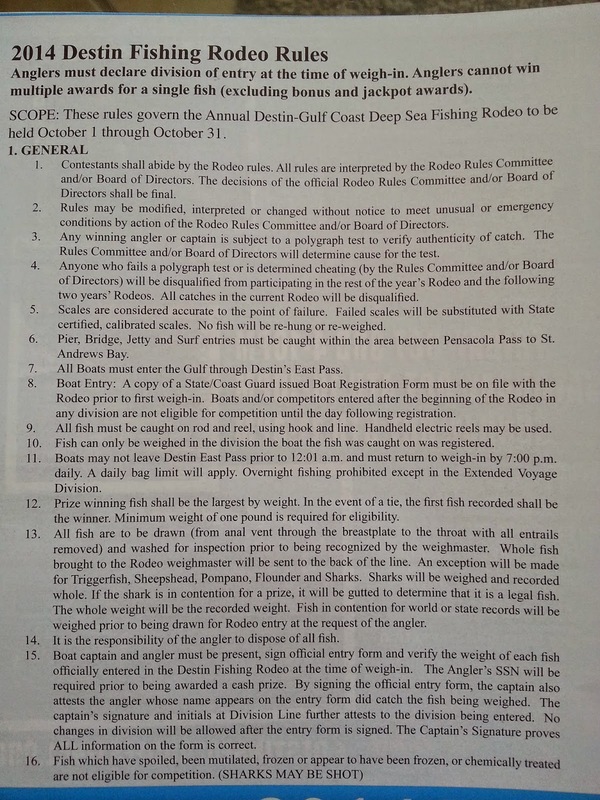 I have included here a picture of the rules and also a picture of the fishing rodeo shirts that are available. Although my calendar looks pretty booked for October, call me anyway at 731-589-7841 to book a reservation. I have "friends" who also own Destin Pelican Beach Resort beach front condos . Have you ever been to the Destin Pelican Beach Resort in the fall? My family just got back on Sunday and we had 8 days of sunshine and 80+ degrees each day. We had a great time and there was so much to do while we were there. The annual seafood festival was going on the weekend we arrived and of course that coincided with the month of October fishing rodeo. As always we stayed at the Pelican Beach Resort Destin and as always the staff treated us like kings. 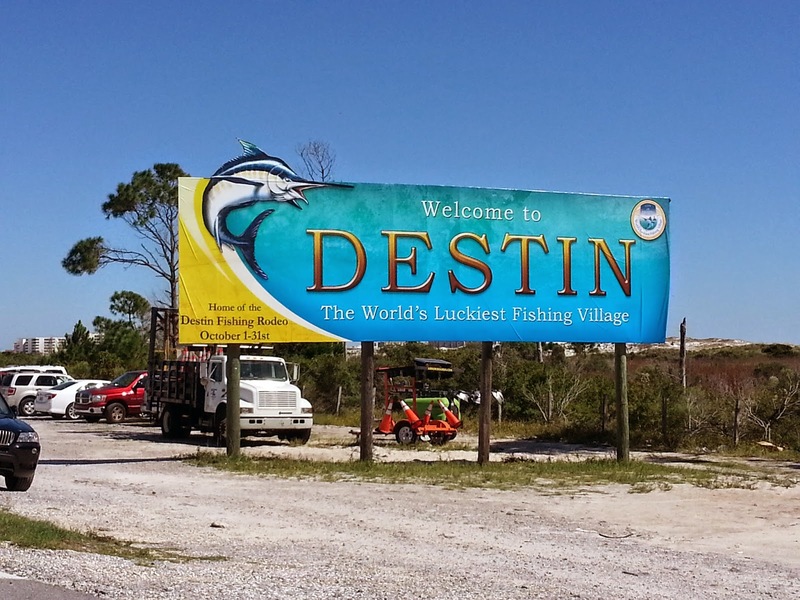 Driving into Destin this is the sign that you will see if arriving over the bridge from Ft. 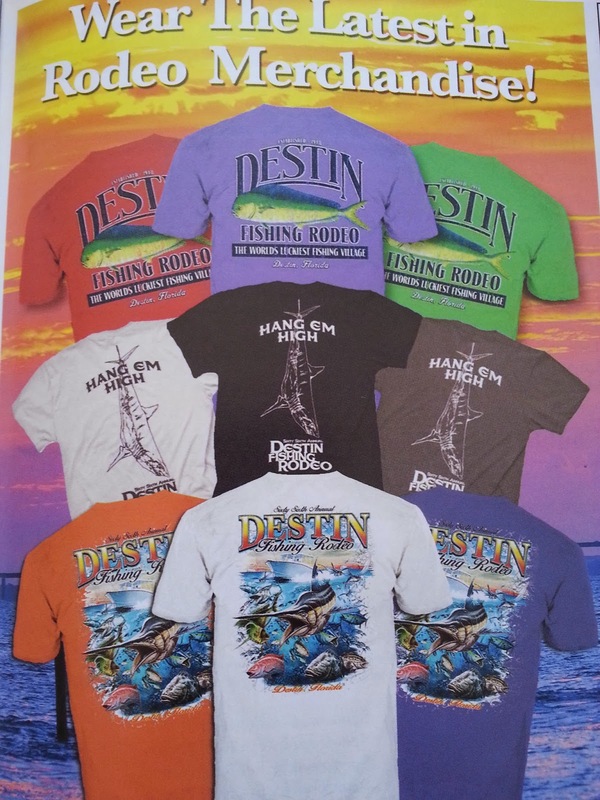 In following posts I will include several pictures from Destin including information about the annual fishing rodeo. The rodeo will last the entire month of October so you still have time to get down there for that. 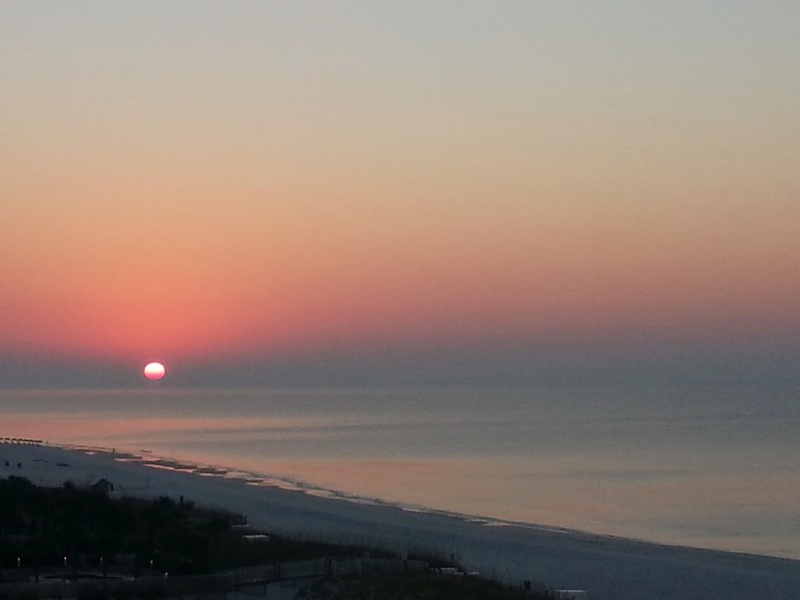 Frazier Properties will have a second Pelican Beach Resort Destin condo available soon. We are in the process of buying a second unit but this time it is a 2 bedroom 2 bath condo on the 7th floor. Currently it has granite countertops, stainless steel appliances and a new central heat and air unit. Gail is already working on updates in the bedrooms and planning renovations through out the unit. If you don't see your vacation dates available on the calendar on the left side of the page don't despair, they will probable be available in the other unit. 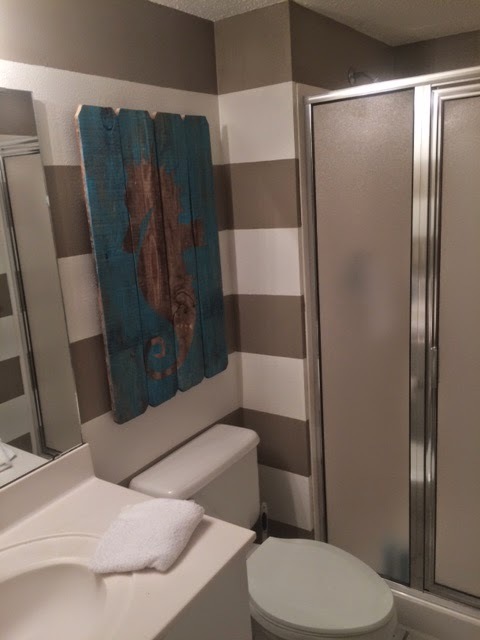 Here is a link to the vrbo listing. Are you looking for a Pelican Beach Resort Destin deal beginning October 12, 2014? Actually I only have 5 nights open(Oct 12-16). that would be a check in on Sunday and check out on Friday. The regular rate would be $943.50 and if you booked it early through the front desk the total rate would be reduced to $735.38. The first one that calls me at 731-589-7841 to book those dates in my Destin Beachfront Condo #1004 the total everything price will be $699. That is more than 26% off the regular rate and about 5% lower than the front desk early booking rate. Check my availability calendar over on the left side for other available dates and then contact me for a great Pelican Beach Resort Destin deal. 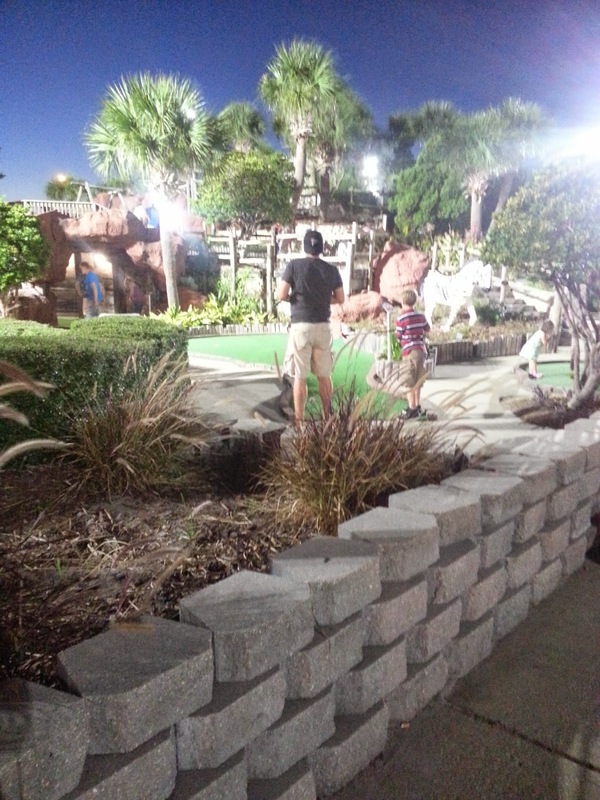 The Pelican Beach Resort Destin is still the #1 vacation destination for the Frazier family. My wife Gail and I just returned from the resort and we had a great time as always. So much has changed since we were there in May. 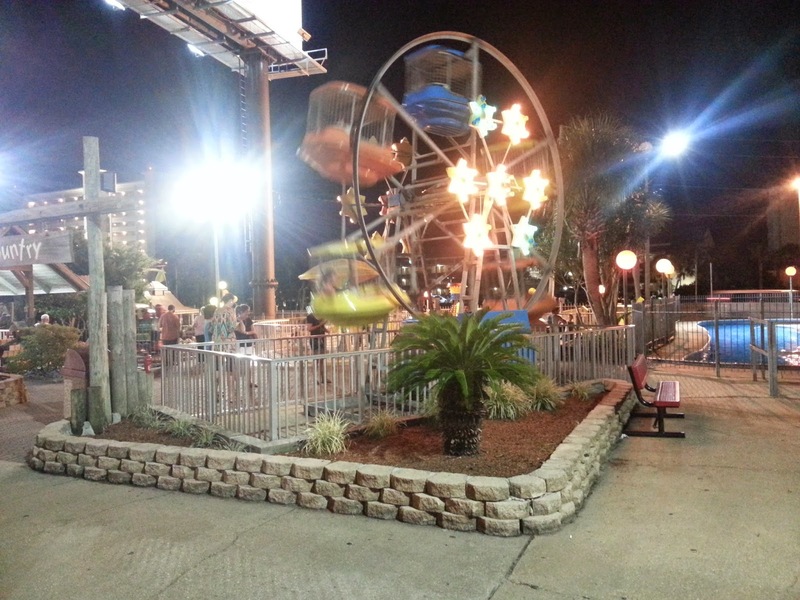 The Destin Pelican Beach Resort installed new gas grills replacing the old worn out ones. I believe we grilled out twice during our 5 day stay. Another big change was the completed additions to the "Commons" shopping center. It appears to me that they almost doubled the shopping space with the addition of several new stores. If you are considering a Destin vacation on the beach, check out my availablility calendar over on the left side. If your dates are not available call, text or email me and let me check with some of the other owners I associate with at the resort. They rent mine and I rent theirs. My direct number is 731-589-7841 or you can email me at Mike@dyersburgrealestate.com. 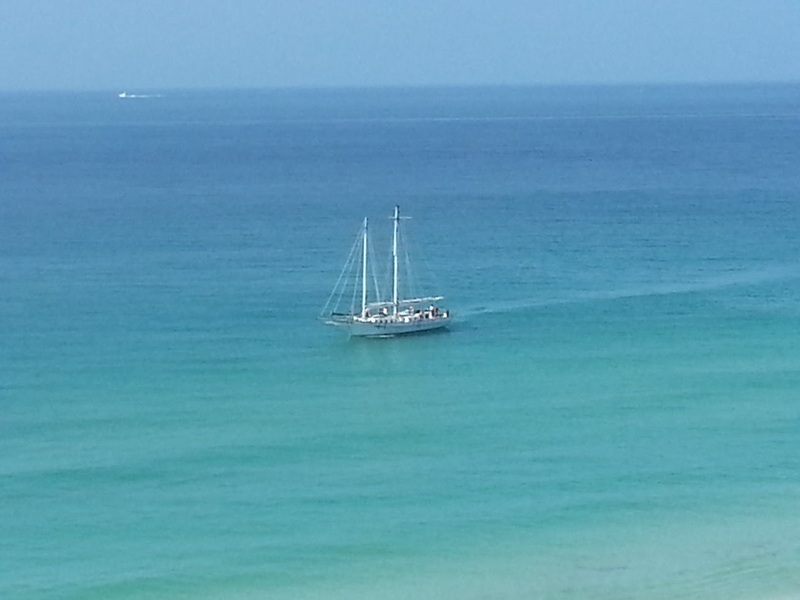 Here is a picture I took of this sail boat while on the beach . The Pelican Beach Resort Destin has great rates for your Florida vacation. If you will look over on the left side you will see my availability calendar which is pretty booked. I did notice 4-5 open nights in August but those should fill soon. I had a friend who talked to me about booking my condo at the end of September into October for a 7 night stay. I quoted him a total price of $950(includes everything). That is about $135 a night. Where else can you book into an exclusive condo on the beach with all the amenities that the Destin Pelican Beach Resort has to offer? He just informed me that I was too expensive. I asked him to do me a favor after he books something cheaper and gets down there on vacation. He agreed to go by and look at the Pelican Resort and tour the indoor pool, 2 out door pools, game room, steam room, sauna, conference hall not to mention meeting all the friendly staff. There is an on site restaurant, tiki bar out on the boardwalk close to the private beach for Pelican Beach guests and owners. After my friend tours the resort I promise you his wife is going to hit on him for not getting her registered at the Pelican. If you don't see your dates open on the calendar call or text me anyway at 731-589-7841. I have several other owners who have asked me to help them book their units(although none have any openings through the end of July). 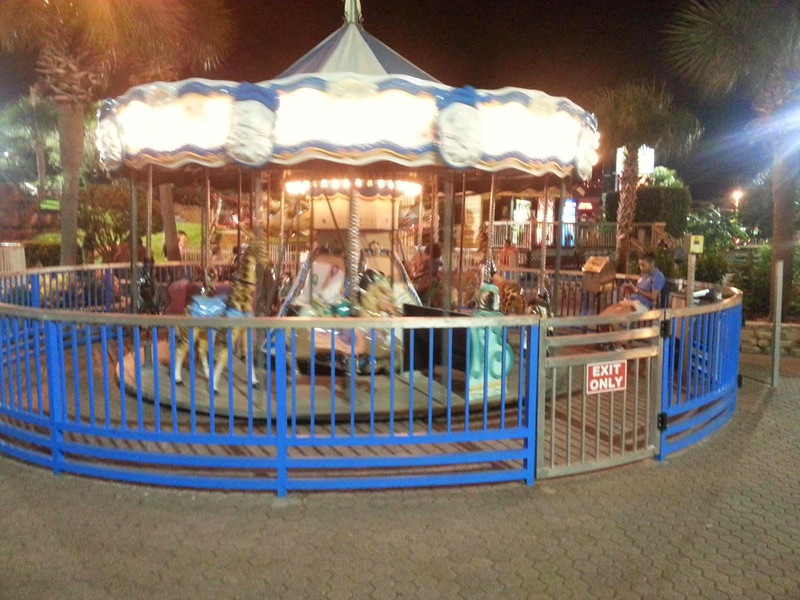 Is a early summer vacation to Destin beachfront in your plans? If so I have a fantastic deal for you at the Pelican Beach Resort Destin. Looking at my calendar I see Sunday May 11, 2014 open for 5 nights. If you call the front desk they will tell you the regular everything price will be $1126.65 but with your 25% off early booking the total price will be $871.35. Normally if you call me to book one of the most rented Pelican Beach Resort Destin beachfront condos and you mention VRBO I would price these dates to you for $850.93. If I then made your discount 30% the total price would be $820.29. How about a total everything price of $799.95? This price is just for these dates and when they are gone they are gone. My direct number is 731-589-7841. Are you looking for a last minute Destin beachfront deal in April? If so have I got a deal for you! I just looked at my calendar and noticed I have 4 nights open beginning April 19 at my Destin Pelican Beach Resort beachfront condo. If you drive to the resort and try to book these dates the total price will be $922.41. If there was time and you were able to book it early you could get a 25% discount and pay $718 17. With your VRBO discount I normally give you could pay $701.83 but for these nights only(April 19, 2014-April 22, 2014) the discount will be 35% off for a total everything price of $636.47. That includes all taxes and fees including cleaning. Call Mike at 731-589-7841 to book this incredible deal before it is gone. Planning A Destin Beachfront Vacation? Are you planning your Destin beachfront vacation? If so you better hurry to book at the nicest Pelican Beach Resort Destin condo ! Unit #1004 is directly on the beach, sleeps 6, totally remodeled and in the top 2-3 of all rentals at Pelican Beach Resort in Destin. The availability calendar is over on the left side and as you can see the dates are filling up fast. I admit that many of those booking are repeat renters who have booked early in order to be able to stay in our unit. Others who stay with us look extensively on vrbo and after receiving our price then book with us. Next year they will probable book with us again. Please do not wait until it is too late so you will not have to settle for less than the best!